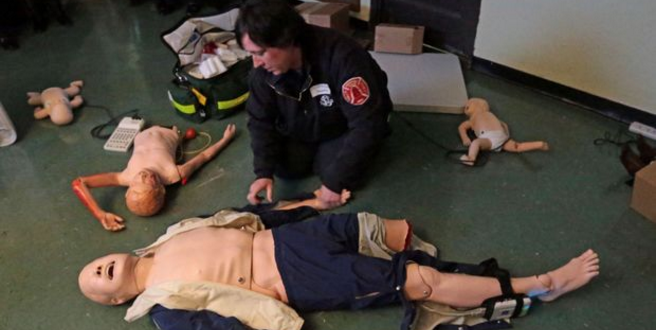 St. Louis firefighters begin training on lifelike child mannequins that can cry out, bleed. ST. LOUIS • Paramedic Joseph Kartje walked into a darkened room in the basement of the St. Louis Fire Department’s EMS headquarters […]. Strobe lights flashed. Amid the toppled table and overturned boxes, Kartje found the aftermath of a hypothetical bomb blast. The six “victims,” high-tech mannequins, were strewn on the floor: two infants, three children, one adult. One had a severed leg. Four were already dead. These were no ordinary dummies. One of them, a boy about 8 years old, moaned. Then talked. Chris Thompson, an EMS supervisor, was manipulating the mannequin by remote. He stood nearby, punching buttons on a handheld computer that made the boy’s blood pressure drop. 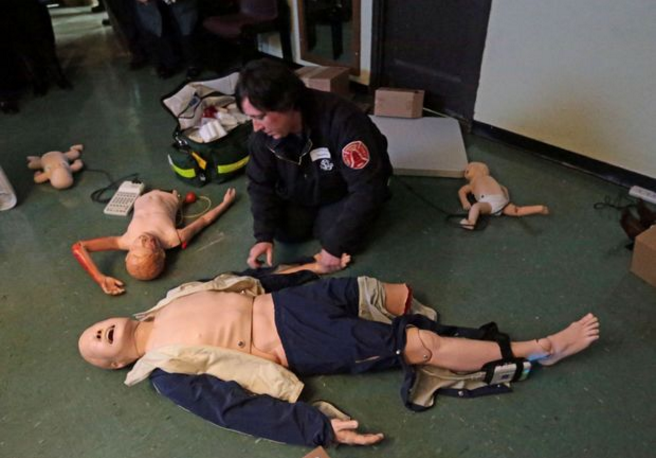 This was all part of a demonstration Wednesday of the training available at the SIM Center, […] where the St. Louis Fire Department is instructing firefighters, paramedics and emergency medical technicians on life-like mannequins. They started training on adult mannequins last year and just started on pediatric mannequins. The mannequins can bleed, give off cardiac rhythms, take intravenous fluids and change color to indicate shock. Every move the first responder makes — right or wrong — is monitored by an evaluator, who has the power to change the patient’s condition. If the trainee makes the wrong health care move, the mannequin’s blood pressure might plummet or its heart might stop. Next the department hopes to transform the […] facility’s basement into realistic scenes for training: an alleyway, a bathroom or a tavern. On Wednesday, the storage room was still used for storage, but they envision using it for a control room, where the evaluator can monitor a scenario from behind glass. The St. Louis Fire Department St. Louis Fire Department Foundation raised about $250,000, through November, for the SIM Center (as in simulation center). Its goal is about $500,000. Most of the expense is the mannequins and computer stations. They hope to invite other agencies to train there at cost. READ FULL ST. LOUIS POST DISPATCH ARTICLE HERE.